Visit magnificent Windsor Castle, the oldest and largest occupied castle in the world and the Official Residence of Her Majesty The Queen, or combine your visit with a tour to Oxford, Stonehenge or the Georgian City of Bath. 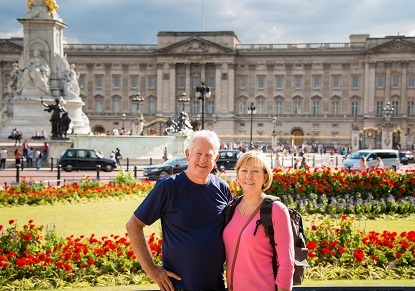 Enjoy a royal day out with visits to the magnificent Royal residences of Buckingham Palace and Windsor Castle, followed by a delicious two-course meal in Windsor. Tour includes entrance to Buckingham Palace and Windsor Castle. Follow in the footsteps of Prince Harry and Meghan Markle as you explore the incredible setting of their Royal Wedding at Windsor, and enjoy a delicious two-course lunch in a 14th Century hotel, opposite the Castle. Tour includes entrance to Windsor Castle and Lunch. Built high above the River Thames, Windsor Castle has been home to the Royal Family for 900 years and is still an Official Residence of the Queen. Windsor Castle is located in the English county of Berkshire about 2 miles west of London. The original castle was built on this site in the 11th by William the Conqueror after the Norman invasions, and has been a Royal Residence since the time of Henry I. It is the largest inhabited castle in the world and the longest occupied palace in Europe. 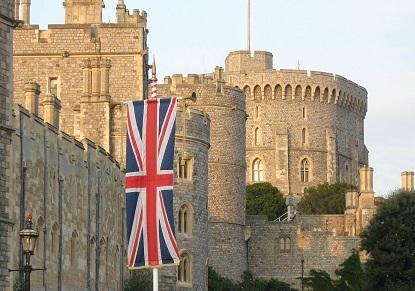 The Queen frequently uses Windsor Castle as her weekend home - the Royal Standard can be seen over the Round Tower when The Queen is in residence. Windsor Castle is open to visitors throughout the year. The original castle was built by William the Conqueror (1066-1087), a motte-and-bailey type structure built from timber with earth fortifications, accompanied by an enclosed courtyard. It was one of a ring of fortifications around London, and was of strategic importance due to its positon overlooking the River Thames, a key trade route into London. The Castle was later rebuilt in stone. Henry II (1154-1189) constructed the Round Tower and the original stone outer wall. Henry III (1216-1272) built a luxurious royal palace, and Edward III (1327-1377) went further, rebuilding the palace to make an even grander set of buildings. During the English Civil War (1642-1651), Windsor Castle was used as a military headquarters by Parliamentary forces and later as a prison for Charles I. After the Restoration of the monarchy in 1660, Charles II (1660-1685) rebuilt much of Windsor Castle creating a set of extravagant Baroque interiors that are still admired today. It has remained largely unchanged since the early nineteenth century, apart from the restoration work following the fire in 1992. The State Apartments at Windsor Castle are lavishly decorated formal rooms still used today by The Queen and members of the Royal Family for state and official functions. The rooms are home to works of art by Canaletto, Holbein, Leonardo da Vinci, Rembrandt, Rubens and Van Dyck. Also on display is a large collection of armour, including an etched gold suit of armour made for Henry, Prince of Wales in 1608. George IV (1820-1830) gave the State Apartments a new grand entrance and staircase, and added the colossal Waterloo Chamber, celebrating the defeat of Napoleon Bonaparte in 1815. He also created a new set of private rooms within the Castle, the Semi-State Rooms. The Grand Reception Room with its chandeliers gold-covered walls and ceilings was once used as the main ballroom at the Castle. Here you can see the large malachite urn, presented to Queen Victoria by Tsar Nicholas I in 1839, one of the largest examples of its kind outside of Russia. The magnificent St George's Chapel was started in 1475 by Edward IV (1461-1483) and completed fifty years later by Henry VIII (1509-1547), and is one of the finest examples of perpendicular gothic architecture in the UK. The Chapel is the spiritual home of the Order of the Garter, the senior order of British Chivalry established in 1348 by Edward III. Ten former monarchs are buried here, including Charles I and Henry VIII with his wife Jane Seymour. The Chapel has also been the location of numerous royal weddings including the recent wedding of HRH Prince Harry and Meghan Markle, now the Duchess of Sussex. The Changing of the Guard is a colourful spectacle that may be viewed on alternate days (mostly) throughout the year. The privilege of guarding the monarch traditionally belongs to the Household Division, who have carried out this duty since 1660. The ceremony takes place at 11.00am as the Guards march through the historic town of Windsor into the Castle and take over from the old guard. A band will usually accompany the Guards, weather permitting. The schedule is subject to change, check the Household Division website for details.